Confetti, bubbles, flower petals… there are dozens of ways for guests to send a bride and groom off after their big day, but few are as stunning as the sparkler. Little did we know… not all sparklers are created equal! We recently met up with Libba, owner of Sparkle, a company whose long-lasting sparklers have been featured in Martha Stewart Weddings, Modern Bride, Brides, InStyle, Southern Living and The Knot magazines, as well as in movies and a recent Coldplay tour. Whew! Libba’s certainly been busy since she and her husband opened their store eight years ago, but she was kind enough to take some time and answer our questions regarding this unique send off, plus provide our brides with some important tips when it comes to using her product. Thank you, Libba, for the answers to our questions. 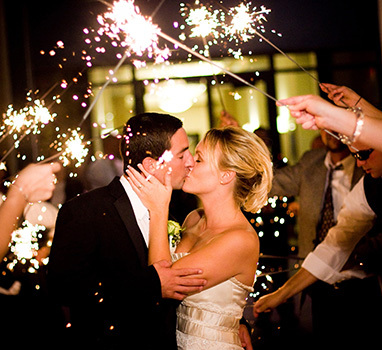 We look forward to seeing our brides use your sparklers during their send-offs! 1. What was your inspiration for starting Sparkle? When my husband and I were 27, we attended 12 weddings… for 8 of those, the bride and groom did a “sparkler send-off” but used the small 10 inch sparklers which burn out in 45 seconds. 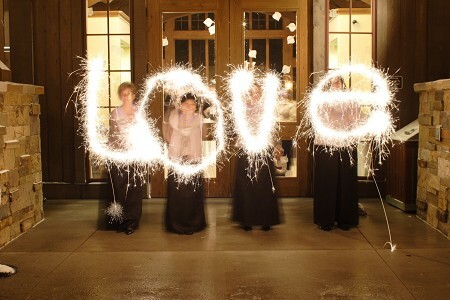 For my wedding three years prior, I did a sparkler send-off, something I had never seen before. as a nod to my family who has been in the fireworks business for over 50 years. After a little research, I learned that no one knew 20 and 36 inch sparklers existed. I decided to take a risk, set-up a website, buy an ad in Martha Stewart Weddings and see what happened. We have had orders every day since for the last 8 years. 2. Could you provide me with a brief overview of your products/services? Which is your most popular product? We offer 10, 20 and 36 inch sparklers. Our sparklers burn the brightest and longest of any sparklers I have seen on the market. Our 36 inch sparklers are the most popular as you only have to give one per guest and they last for 4 minutes each. With the 4 minutes, you have plenty of time to get the sparklers list (and if you have 200 guests, it takes a little time), your guests lined up and plenty of time for a grand exit. 3. 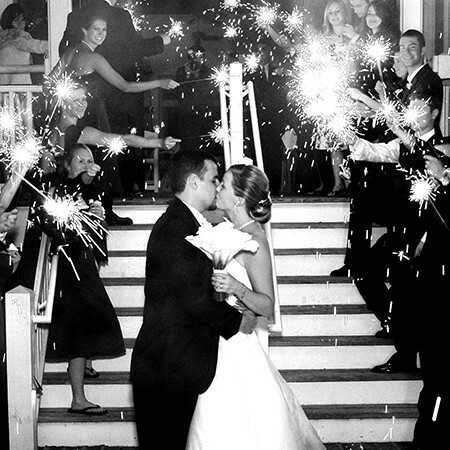 Any advice when it comes to setting up the perfect sparkler photo? The more sparklers lit, the better. Have guests hold two if there are any left over. And be sure to tell your photographer in advance so if they are unfamiliar with photographing sparklers, they can study up beforehand. 4. Any other advice for brides planning their wedding day? Have fun, enjoy the process. I love that brides tell me that their sparklers photo is their favorite and that sparklers were the detail most guests remembered. They also laugh when they realize they only spent about $100. Sparkers provide quite the impact for such a little amount of money. Thanks again to Libba for answering our questions. We loved perusing the many amazing photos on her website of couples using sparklers, and can’t wait for our future brides to create their own brilliant, unforgettable moments! What’s up colleagues, fastidious post and fastidious arguments commented here, I am really enjoying by these.